The road to happiness is broken into three broad segments: 1) preparation for the journey, 2) the journey, and 3) the adventure. Having a caring family and a functional society contribute to any individual’s preparation for the journey. I have already discussed this in earlier posts. Harnessing the entrepreneur with each of us is the best way to make the journey by developing social skills and self-esteem that lead to confidence, strength, achievement, prestige, and financial comfort. Academic research indicates that successful entrepreneurs exhibit these same traits of education/training, social skills, and high self-esteem. Those exhibiting these characteristics have the best chance of reaching the end of the journey. The last several posts have discussed this journey. Once the journey has been completed, then the road continues with the adventure. The adventure of any individual begins with a call or summons. The call is the command to leave behind the journey and accept the adventure into the unknown. Those that receive this call, and recognize it, are put in a very tough position. They are asked to select the road less traveled into an unknown future, rather than stay on the more popular path that others are on. This is very difficult to do; after all, the individual who has reached this point most likely has a very comfortable life, with financial comfort, many friends, and the prestige and recognition of others in his/her community. This tough position, the pondering of the call or summons to the adventure, is seen in the following two artworks. Both works are very dramatic and are among the greatest of artworks ever created. The arrivals on the right are poor people with bare feet and simple garments. Their appearance contrasts sharply with the richly clothed Matthew and his four companions. A strong beam of light guides the eye from the outstretched hand of Jesus across to Matthew. 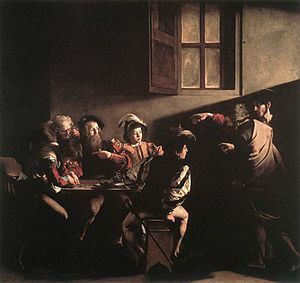 Among art scholars is debate as to whether Matthew is the bearded man pointing to himself (with a look of surprise) or the younger man with his head down (looking bewildered and uncertain, but comfortable in his status and wealth). This work, perhaps the artist’s most famous, begins with the popular four-note motif. It is suggested that these notes represent fate (or the call) knocking at the door. This motif is repeated throughout the piece. What is clear is that a decision has not been made. The knock comes several times during the piece. Perhaps this piece echoes the sentiments of the Caravaggio painting regarding the uncertainty and hesitancy of accepting the call – a call that is awaiting a decision. Next up: the details of the adventure. 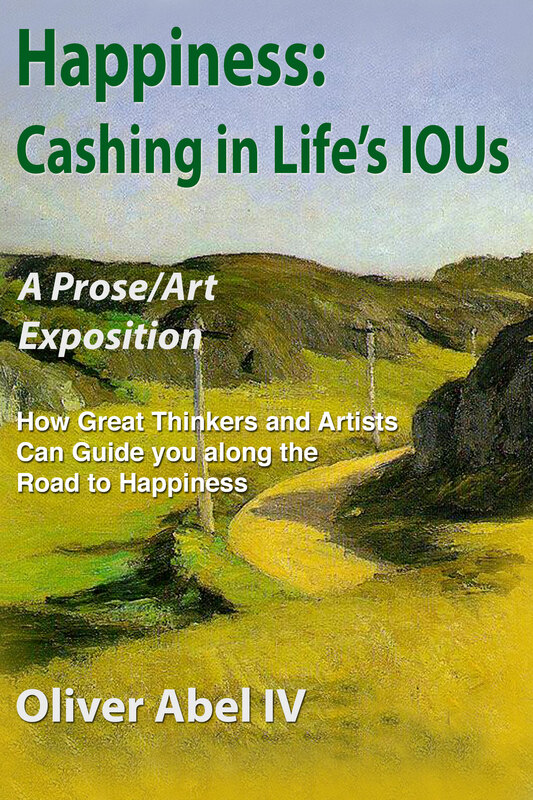 This entry was posted in Uncategorized and tagged beethoven, Caravaggio, entrepreneur, happiness, self-fulfillment on October 2, 2013 by oliver. In my previous post I mentioned that four traits or types of behavior are needed to travel the road to happiness. It just so happens that these four traits have been identified by researchers as the same traits of “successful” entrepreneurs. This is good news. I have already mentioned two of these four traits: education/training and social skills. Both of these are needed for the journey of life and both have been identified by psychology researchers are requirements of successful entrepreneurs. It is no big surprise that these traits are needed for the road to happiness. We all need to be educated/trained to have a job and live in today’s complex world. We also need social skills to interact with family, friends, our neighbors, and at our job. However, there are two additional traits of successful entrepreneurs: an orientation to the future and motivation to identify opportunities that others do not see. Successful entrepreneurs are ones that have an orientation to the future – they are very concerned with “missing the boat” in the distant future and willing to take risks and explore opportunities today to avoid regretting a future lived below expectations. This is a very important trait and explains a lot of why entrepreneurs do what they do. They are preoccupied with not experiencing regret in the future for inaction today. As such, they are willing to do things to ensure that their future will be lived as best as possible. In essence, these entrepreneurs are proactive – they are taking action today in order to enjoy a future that might be lived above expectations. They are not waiting for whatever might come their way. The second trait is related to the above trait: desire to capitalize on opportunities that others do not see. It is not that entrepreneurs are more prone to taking risks; they just see opportunities differently than others see them. In fact, they may believe that the opportunities that they see may be less risky than staying in their current job. Both of these traits are related to each other. The desire to capitalize on opportunities that others may view as risky is driven by an orientation to the future and a life that will not be lived below expectations. In other words, “successful” entrepreneurs are always looking for new opportunities in order to make sure that their future is lived as best as possible by those actions taken today. The above painting by Winslow Homer, discussed in far greater detail in my book, is an excellent depiction of the two traits. The young woman is viewed leaving her friends for an opportunity that she recognizes and that the others in the group do not see. In addition, she is seen expressing a reserved confidence that this new opportunity will lead to a future life lived above her expectations of today. In the next post, I will summarize all four traits. 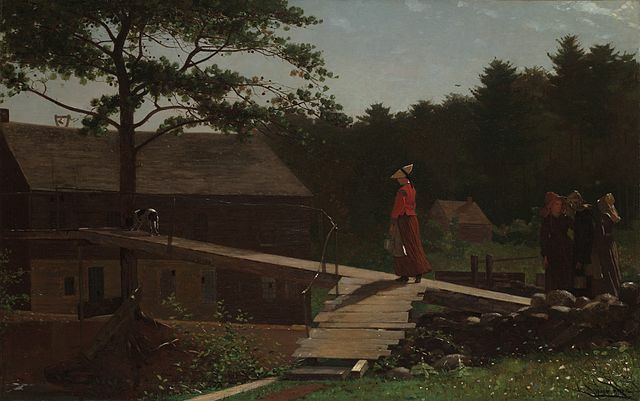 This entry was posted in Uncategorized and tagged art, entrepreneur, Fine art, fulfillment, happiness, Winslow Homer on July 15, 2013 by oliver.